Desert Dream Royal Camp in Sam provides you amazing and exquisite service with top-notch facilities like Luxury Desert Camp Jaisalmer, Royal Camp in Jaisalmer, Tent in Jaisalmer. It provide your palette with the plethora of cuisine that are crafted by taste, what can take away from the experience when a different array of cuisines are crafted by our meticulous cooks and waves of relaxation. Desert Dream Royal Camp Provided Luxury Tent in Sam. 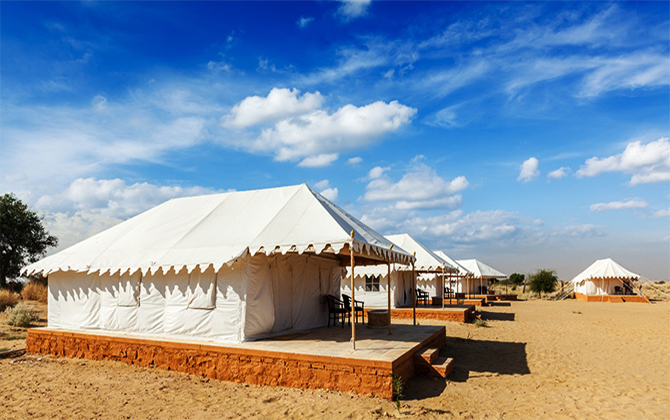 Desert Royal Camping in Jaisalmer offer rustic and spacious tent in Sam with all modern conveniences. Our Luxury Tent in Jaisalmer come with twin beds draped in crisp clean cotton linens. Every tent in Jaisalmer has a sit out verandah silenced generator and attached toilet (tiled and fabricated) with proper facilities like running hot and cold water. The Luxury Tent in Sam are also adorned with candles lantern and mashals to offer you a sense of the ancient way of living. Desert Dream Royal Camp in Jaisalmer provides Swiss Tent in Jaisalmer and Tent in Sam in the traditional Indian environment with all type of facility including medical and accommodation facilities. Not the kind of of holidays most people like. However, if you're not looking for bustling bazaars, jostling malls, videos in every room, music systems in every passing Car and other such tourist attractions, you might consider our Camp Tent in Sam quite charming.